What is Invisalign and Why Should I Choose It? What is Invisalign and Why Should You Want it? Invisalign will make you smile. Feeling confident about your teeth and smile is essential for healthy self-esteem and confidence. Getting your best smile often requires some help. Forty years ago, there was only one option for teeth straightening, but innovations in the field of orthodontic science have led to some exciting new options. Invisalign offers you orthodontic treatment in an invisible, bracket-free, wire-free way. Invisalign uses a series of clear, custom-made removable aligners to straighten your teeth overtime. Learn how they can help you! When Invisalign® was first revealed as a treatment option, it triggered something truly extraordinary in the field of orthodontics–an invisible, removable design. As an Invisalign® patient you wear a series of clear, removable orthodontic aligners that are adjusted as the teeth shift into place without metal or wires. Working professionals, musicians, athletes, and adolescents love that the aligners are clear and not easily noticed by others. The design of this orthodontic treatment option also results in less trips to your orthodontist for adjustments. The removable design also makes it much easier to continue practicing your excellent oral hygiene efforts unlike traditional braces with brackets and wires that get in your way. 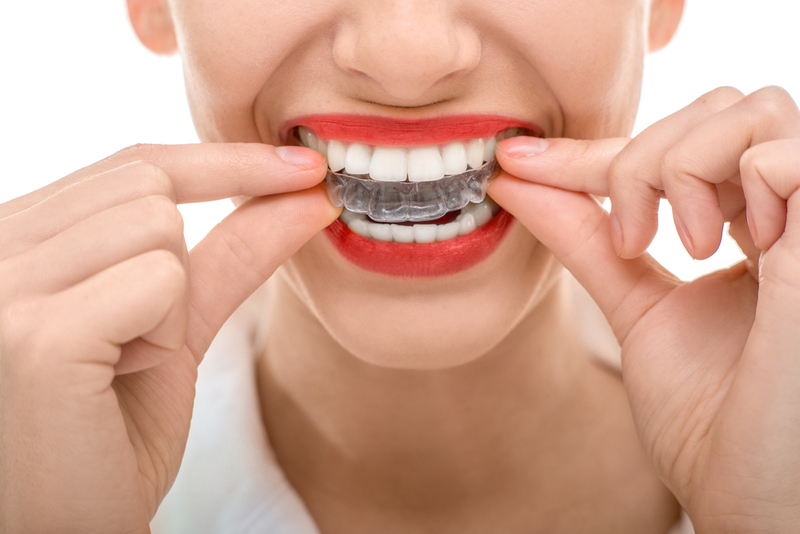 No one can argue with the clear, aesthetic design Invisalign achieves. The translucent braces are much less noticeable than other types of braces and blend in naturally with your teeth. For certain professionals this clear design is a necessity! Clear braces allow you to keep sharing your beautiful smile with others throughout the treatment process without worrying that metal brackets or wires will distract or inhibit your activities. No Need to Give Up Your Favorite Foods! Traditional braces have metal wires and brackets that can break with they engage with certain foods. For this reason, patients with traditional treatment are asked to give up certain foods until their braces have been removed. Common foods that you can’t eat with traditional braces include: popcorn, chips, bagels, hard-crusted bread, pizza crust, pretzels, nuts, certain candies, apples, carrots, and corn on the cob. Invisalign doesn’t require that you alter your diet since you remove the clear aligners when you eat. Traditional braces require vigilant, dedicated cleaning and care. Neglecting a dedicated oral hygiene routine can invite decay to creep in under the brackets or between your teeth where it is difficult to floss. The brackets and wires inside the mouth can also bring pain, discomfort, mouth sores or injuries caused by the brace wires, plaque buildup, tooth discoloration, and tooth/bracket breakage. Why Should I Choose Belmar Orthodontics for My Invisalign? Board Certified by the American Board of Orthodontics , Dr. Hardy is an award-winning Lakewood orthodontist and an active member of the American Dental Association and the American Association of Orthodontists. Dr. Hardy works to create a comfortable and personalized experience for each of his patients. Dr. Hardy, believes that your smile plays an essential role in your overall health, function, and self-esteem. He has experience with a variety of bracket systems for improving your smile that are recommended based on your goals and specific needs. Dr. Hardy is the recipient of The Everett Shapiro Award in Orthodontics, as well as the Dr. Harold Berk Endowed Prize Fund for Excellence in Research. He has published and presented his research both nationally and internationally. With credentials like these, you know that you are in good hands! Expert care coupled with expert experience will deliver you the results you are looking for! The best way to find out how Belmar Orthodontic’s superior orthodontic technology with Invisalign clear braces can benefit you is to schedule an appointment for an in-office consultation. Dr. Hardy can talk with you about your smile goals and come up with an effective treatment plan to help you achieve them. Contact our office today at 303.225.9016. We are excited to meet you and help you reach your smile goals!